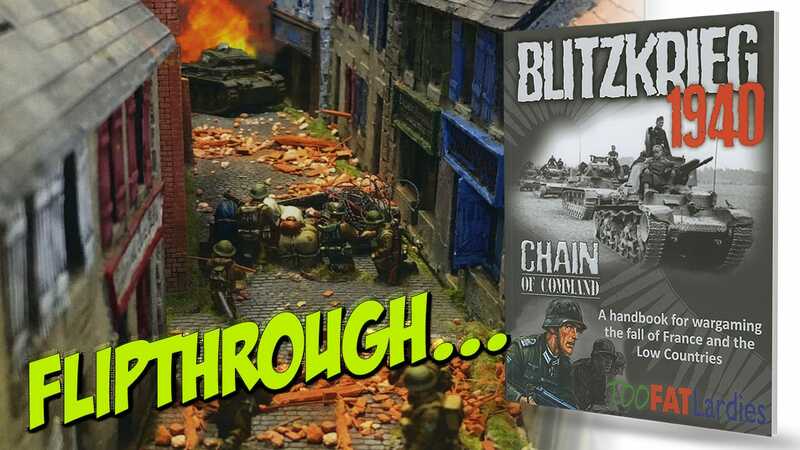 The latest release for Too Fat Lardies Chain Of Command World War Two rules is Blitzkrieg 1940. This 124 page softback book charts the Fall of France and the Low Countries during Spring and Summer of 1940, whilst providing a number of special rules, amendments and suitable army lists for gamers. The book begins with a useful introduction to the ideas and overall intention of the handbook. A really useful overview of the events, with discussion of the preparedness and forethought of each of the nations involved, covers the first 9 pages ‘proper’ of the book. This informs without confusing, makes suggestions on what was ‘right’ and ‘wrong’ with each nation’s forces, and has some useful maps. It is a potted history, but a suitably succinct and informative one for those in need of a rapid introduction. There are a number of rules amendments and additions to reflect this particular campaign, plus new rules for theatre specific conditions, such as fifth columnists, river crossings, glider landings and even Stuka attacks, changes to the armour rules and combat engineering in terms of bunkers, bridges and how to destroy them. These rules either replace those from the core rulebook, add to them or are only relevant to this particular campaign theatre and period. A lot of work has gone into these to reflect the fairly unique aspects of combat in Western Europe in 1940. The book includes around sixty Army lists and fifty Support lists covering the forces of France, Germany, Great Britain, Belgium, the Netherlands and Italy. The level of detail, rules, basic introductions and advice is firmly focused upon the core rules system but also adapts what has gone before and is presented in a clear, easy to use style. The level of accessibility of these sections is excellent, and the book could also be used with other rule sets as a guide to what was available in 1940. The basic platoon choices are supplemented by a series of list choices for each support option, with a ‘Force Rating’ process being adopted to enable balancing of scenarios. Speaking of scenarios, there are 5 outlined towards the rear of the book, typical of those encounters that took place between the forces involved in 1940. These have basic maps, full instructions for use and options for gamers to use, plus a brief piece of advice that places the scenario in a historical context. This is an essential book for those interested in gaming this particular period of the Early War in Western Europe. Although intended for use with the Chain of Command ruleset, the special rules and army lists could be fairly easily adapted for others. A fairly comprehensive and eminently accessible supplement, Blitzkrieg 1940 would grace the shelves of any gamer interested in World War Two.